07 MARCH 2011 — The US and NATO are supporting an armed insurrection in Eastern Libya, with a view to justifying a "humanitarian intervention". US and NATO military advisers and special forces are already on the ground. The operation was planned to coincide with the protest movement in neighbouring Arab countries. Public opinion was led to believe that the protest movement had spread spontaneously from Tunisia and Egypt to Libya. The Obama administration in consultation with its allies is assisting an armed rebellion, namely an attempted coup d'Etat: — 1,926 words. Cartoon by Steve Benson, Comics.com, 11 March 2011. 09 February 2011 LONDON — A new WikiLeaks cable suggests that the Obama administration handed over British nuclear weapons secrets to the Russians. Andrew Roberts denounces this dangerous betrayal of Britain and America’s special relationship. The reports that the Obama administration has told the Russians certain British nuclear secrets in order to secure a New START promotes him from being a mere irritant for the Special Relationship to a downright menace. It is bad enough the president arrogating to himself the decision as to who should rule in Egypt, but it is completely unacceptable for him to undermine the whole basis of the British nuclear deterrent, which has always been to keep the Russians guessing about how many warheads the United Kingdom has. — 990 words. 01 March 2011 WASHINGTON DC — As America's middle class battles for its survival on the Wisconsin barricades — against various Koch Oil surrogates and the corporate toadies at Fox News — fans of enlightenment, democracy and justice can take comfort from a significant victory north of the Wisconsin border. Fox News will not be moving into Canada after all! The reason: Canadian regulators announced last week they would reject efforts by Canada's right-wing Prime Minister, Stephen Harper, to repeal a law that forbids lying on broadcast news. — 416 words. Now that Commons Speaker Peter Milliken has found the Conservatives guilty of contempt of Parliament, all roads in the House of Commons seem to lead to a spring federal election. To understand why, consider the following: If the Prime Minister wants to extend the life of his minority regime beyond this month’s make-or-break budget, his best and likely only option is to throw himself at the mercy of the NDP. As Stephen Harper knows, Jack Layton and his party have overlooked ethical transgressions on the part of a governing party in the past . . . but only for a policy price.— 630 words. What a beautiful description you provided of Arts Night at the First Unitarian Church! I almost felt as though I had been there. Fascinating! Yes, those people are cultured. I'm sure they really enjoyed hearing you talk! And it was very thoughtful of you to post their social calendar. — Sigrid Macdonald, Ottawa, Ont. 11 March 2011 — The St. Lawrence Seaway accomplished a remarkable turnaround in 2010 and is hoping to perform even better this year as the North American economy recovers. Then Finance Minister Jim Flaherty picked March 22 for his 2011 budget. As a possible trigger to a federal election, the budget will dominate the news that day. The Seaway opening might get mentioned in passing. —752 words. 8 March 2011 — A move by farmers in developing countries to ecological agriculture, away from chemical fertilisers and pesticides, could double food production within a decade, a UN report says. Insect-trapping plants in Kenya and ducks eating weeds in Bangladesh's rice paddies are among examples of recommendations for feeding the world's 7 million people, which the UN says will become about 9 billion by 2050. "Agriculture is at a crossroads," says the study by Olivier de Schutter, the UN special reporter on the right to food, in a drive to depress record food prices and avoid the costly oil-dependent model of industrial farming. — 545 words. 11 March 2011 — These words from Edward Sellner could not have been more appropriate in light of this year’s March 8th celebration of International Women’s Day at Place Sarsfield as they also celebrated the 125th anniversary of Sarsfield’s Saint-Hugues parish. Organizers wanted to honour some of the region’s fabulous women as well as remind us of women who were at the forefront of Canadian history. A quiz was used to test our knowledge of history reminding us, for example, that Roberta Bondar was the first Canadian woman to become an astronaut, Kim Campbell was our first woman Prime Minister, Jeanne Sauvé was our first female Govenor General and Cairine Wilson, the first woman to be nominated to the Canadian Senate in 1931. — 1,348 words. 11 March 2011 — Attack Ads on Attack Ads: it is to me the most responsible of all political electioneering at this time, even if an election writ has not yet been dropped. If indeed Canadian voters are susceptible to that kind of political tactic then I fear for this country’s future and for democracy. In two world wars Canadian men and women have gone abroad to fight for democracy and against demagogues and their dictatorships. Are we willing to belittle their sacrifices? Are we willing to surrender to despotism of whatever stripe? — 957 words. 11 March 2011 — My favourite mornings are Monday, Wednesday and Friday when I go swimming at our local community centre. If you are ever feeling low just shove yourself out that door and join your local therapy swim group. Every time I step into the change room at our community centre I hear the sound of laughter and buzz of excitement I can't help but catch the bug. My mind gets clear of problems and I smile with everyone as they exchange latest experiences. — 538 words. 03 March OTTAWA—James Travers, an award-winning national columnist and former executive managing editor for the Toronto Star, has died. “Jim was a first-rate friend of many years and a journalist I enormously admired,” said Starpublisher John Cruickshank. A national affairs columnist in Ottawa for the Starsince 1999, his career was capped last year when he won a National Newspaper Award for political writing. .
Travers joined the Starin 1997 and led the newspaper for two years until he returned to political writing in the paper’s Ottawa bureau. — 1,640 words. 07 March 2011 HAVANA— Alberto Granado, who has died aged 88, was a biochemist from Argentina whose name became indelibly associated with that of Che Guevara, his revolutionary friend and former travelling companion. 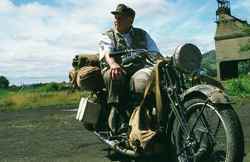 Their travels together through Latin America in the early 1950s were given fresh currency more than half a century later in Walter Salles's popular film, The Motorcycle Diaries (2004). Both men wrote diaries of their journey that fed into the creation of the myths associated with Guevara's life and death. Granado was born in the Argentinian province of Córdoba, the son of an impoverished Spanish immigrant and trade unionist who worked on the railways. He became friendly with the teenage Guevara largely because Alberto's younger brother, Tomás, was at school in Córdoba with the future revolutionary; Guevara was soon enrolled in a rugby team that Alberto had organised. — 1.178 words. 08 March 2011 EL PASO Texas — Through the powerful testimony of the Cuban forensic pathologist, Yleana Vizcaíno Dimé, the prosecution proved to the jury—today—that the death in Havana of Fabio Di Celmo on September 4, 1997 was a homicide. Dr. Vizcaíno testified in El Paso that Fabio Di Celmo died from "a mortal wound that necessarily caused massive hemorrhaging that was impossible to stop." The defense counsel could not impeach her testimony. Consequently, her sworn statements stand as irrefutable evidence in the trial against Luis Posada Carriles. — 2,726 words. O8 March 2011 MERIDA, Venezuela— A U.S. diplomatic cable released by Wikileaks and published yesterday reveals the U.S.’s fear over the consolidation of the Southern Common Market (Mercosur) and Venezuela’s entry to the organisation. The cable also argues that the U.S. needs more resources to counter what it sees as Chavez’s efforts to assume greater “dominion” over Latin America at the expense of U.S. leadership and interests. — 976 words. 05 MARCH 2011 GUATEMALA CITY — The victory of Laura Chinchilla in Costa Rica's presidential elections, and the growing participation of women in Central American parliaments, point to their progress in the region's spheres of political power. "The election of a woman president in Costa Rica is a step forward for women in the region's political arena, and a qualitative advance in terms of political democratisation," political analyst José Dávila Membreño told IPS. Chinchilla, of the governing National Liberation Party (PLN), became the third woman president to be democratically elected in Central America, after Presidents Mireya Moscoso in Panama (1999-2004) and Violeta Chamorro in Nicaragua (1990-1997). "Women have been discriminated against, with a view that they should stay at home and that they are not fit for public responsibilities. But this attitude is gradually being overcome, because women have shown that when they occupy public office, the quality of politics can improve," said the political scientist. — 1,023 words. 11 March 2011 — I am baffled by the argument that the United States can incur big savings by ending the war in Afghanistan and, more generally, by cutting bloated defense budgets. I’ve mostly been hearing this from liberals, and indeed this is a variation of a debate that has continued for years. So, yes, the United States spends a lot of money, unnecessarily, on defense. In fact, this is almost surely the most wasteful part of the federal budget, mainly because politicians are afraid to say no to the military for fear of being called unpatriotic. Aside from the question of whether the wars in Afghanistan and Iraq are too expensive to fight — invading Afghanistan made sense in 2001, but I have no idea what we’re doing there now — it has long been clear that the United States military is still warding off threats that haven’t existed since the fall of the Soviet Union. — 441 words.